Kasper Schmeichel believes Leicester are just as hungry as ever. KASPER SCHMEICHEL INSISTS Leicester City are just as hungry as ever to win as they look to defend their Premier League crown. 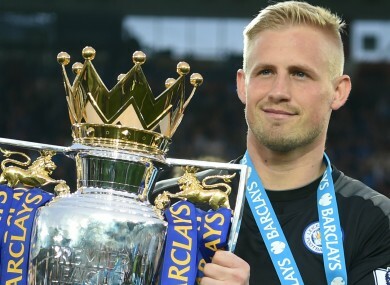 Schmeichel and his team-mates stunned the footballing world after claiming the title in 2015-16, having started the season as favourites to be relegated. Leicester lost just three times in the league all season – twice to Arsenal and once away to Liverpool – with Schmeichel keeping an equal second-best 15 clean sheets. And now, as the side prepare to defend their title as well as begin their first Champions League campaign, Schmeichel says Leicester want to win all they can. “When you win a Premier League title it still feels a bit surreal after a couple of weeks,” said Schmeichel, who penned a new five-year deal at the King Power Stadium last week. “When I came back to training I was immediately struck that the hunger is still there. You can see it among the team, everyone is just buzzing to be back. Leicester were able to keep hold of stars Jamie Vardy and Riyad Mahrez and also have a few new additions to the squad, but lost influential midfielder N’Golo Kante to Chelsea. “Time will tell if the squad is stronger [than last season] but we are not a one-man team,” Schmeichel added. “We are a very closely knit unit. We don’t go around pretending to be this or that or saying ‘we are going to do this or that’. We just work hard for each other every single game. Email “Schmeichel: There'll be no title-winning hangover for Leicester City”. Feedback on “Schmeichel: There'll be no title-winning hangover for Leicester City”.